These small Geocache stash cards are an ideal addition to any geocache - new or old. 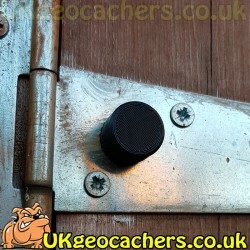 Simply drop one into a cache container and if anyone finds the cache by accident (ie non geocaching muggle) then it'll let them know all about geocaching and where to find out more information about the pursuit. It will also help to prevent caches being considered trash if found by muggles. 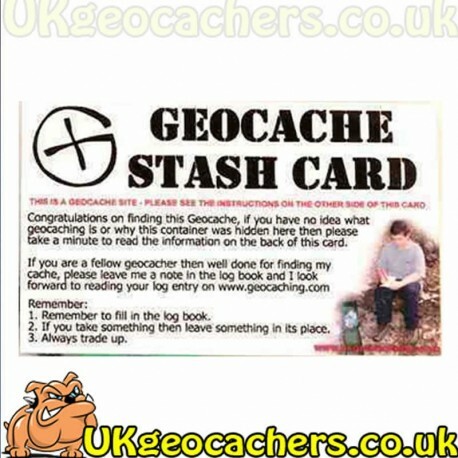 The Geocache stash card is an ideal addition to any geocache - new or old. 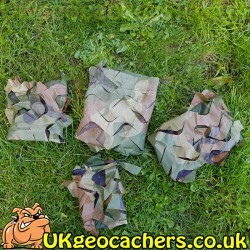 Simply drop one into a cache and if anyone finds the cache by accident (ie non geocachers - muggles) then it will let them know all about geocaching and where to find out more information about the pursuit. It will help to prevent caches being considered trash if found by muggles. These are printed in high resolution on quality paper and then sealed in a laminating pouch to keep them watertight. 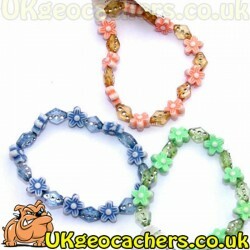 They measure approximately 86mm x 54mm so will fit in all but the smallest geocaches. Don't forget to add one to your geocache today.